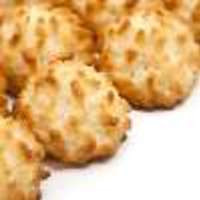 Delicious buttery coconut cookie macaroon. Im tired of releasing recipes with coconut in it but this is too good not to share. Let it sit for at least 3 days and you are left with a banging coconut cookie type vape. I initially mixed this recipe on 12/8. On the 3-day steep recommended, I thought it tasted like a terrifically accurate representation of a coconut macaroon. Unfortunately for me, it reminded me that I don't really like coconut macaroons all that much, but that's no fault of the recipe, I just am not a huge fan of the things. 5 stars for accuracy, though from this mixer that's no surprise. I set it aside with the intention of writing a review for it later, got busy with other things, and forgot about it. Tried it again 1/22 and wow has it changed. Much of the coconut has faded and a strong caramel flavor has come out. A delicious, strong caramel flavor. I love this stuff now. Also worth noting, it tastes like all it would need is a touch of the right chocolate flavor or flavors to become a Samoa cookie recipe, for anyone who might be chasing that. This turned out great! Very smooth and ADV worthy.